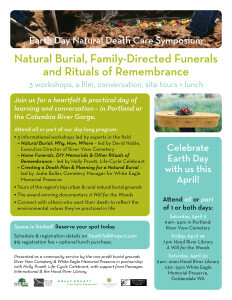 Presented as a community service by the non-profit burial grounds River View Cemetery & White Eagle Memorial Preserve in partnership with Holly Pruett, Life-Cycle Celebrant and Home Funeral Guide, with support from Passages International and the Hood River Library’s Grave Matters discussion series. 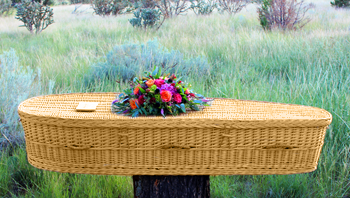 Holly Pruett, Life-Cycle Celebrant & Home Funeral Guide ~ A Life-Cycle Celebrant and Home Funeral Guide, Holly works with individuals, families, and communities to create unique, personalized ceremonies from cradle to grave. As a community conversation leader, Holly has organized PDX Death Café (the largest in the world) since 2013, and was the driving force behind the 500-person conference Death:OK (Let’s Talk About It). 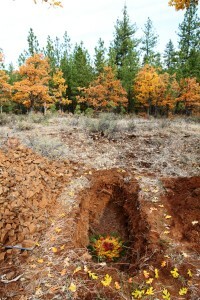 The Natural Death Care Symposium marks the launch of her latest community education offering, the Death Talk Project.